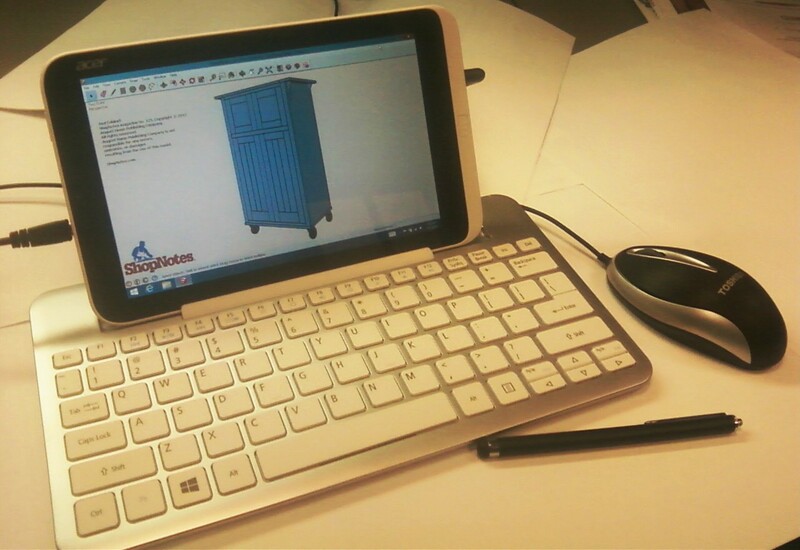 I recently had the opportunity to try using SketchUp on an Acer Iconia 8″ Tablet. You can install standard Windows applications on this tablet. What you see on the left is screen capture on the tablet of a SketchUp model I downloaded from ShopNotes magazine. The user interface in SketchUp was designed for use with a mouse so I was curious to see how it behaved on the Windows 8 tablet interface. I was disappointed to find out that SketchUp ignores the Windows 8 tablet right-click function (press and hold). Since the use of context menus via right-clicking is critical for efficient SketchUp use, you’re pretty much limited to the native, default tool functions. I also discovered that using my large fingers for drawing functions was pretty frustrating. So I switched to using a capacitive stylus which gave me much more control of precise cursor movement. But I still wasn’t able to access the context menus normally available by right-clicking. I quickly learned that to be as productive on the tablet as I am on my laptop or desktop PC, I need to use a mouse. Since I didn’t have a bluetooth mouse, a USB mouse worked great. (You’ll need an adapter to convert from the micro USB port on the tablet to a standard USB port.) I felt more at home using the mouse. But there was still the issue of using the keyboard for input into the Value Control Box. Using the popup Windows 8 keyboard didn’t seem to work for me. Fortunately, Acer makes a bluetooth keyboard that also serves as a stand for the tablet. It’s a $60 option, but if you want to do any serious typing while sitting at a coffee shop or at home, it’s the way to go. With the keyboard connected, entering values was a cinch. The setup I use for serious SketchUp modeling while on the go is shown in the right photo. There was one other annoying thing I noticed when using SketchUp on the tablet. When drawing objects, it leaves ghost images trailing the mouse movement. As soon as you change views by zooming or orbiting, the artifacts disappear, but they can still be a little bothersome. 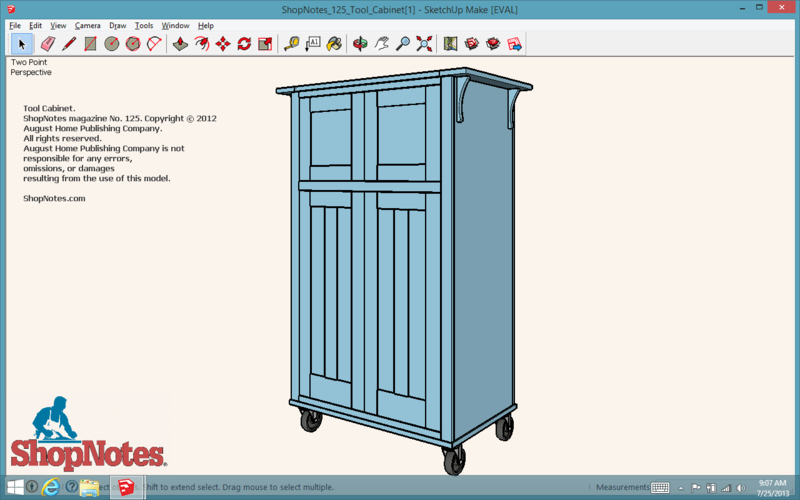 Overall, I was thrilled to have an option for using SketchUp on the road. 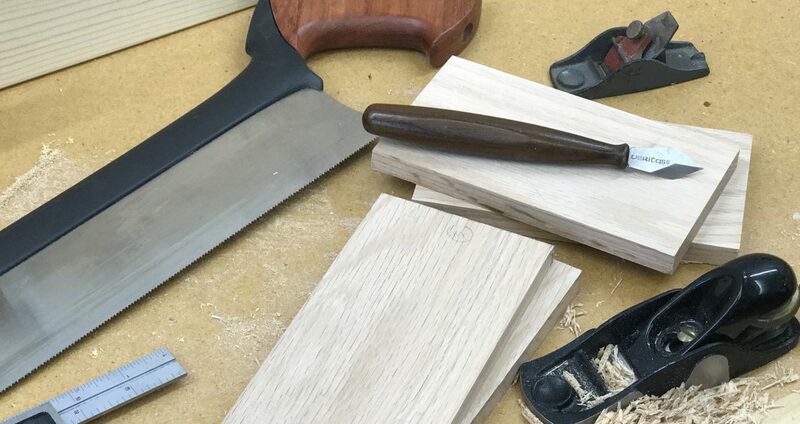 It’s great for showing clients your and their design ideas in real time. Or if you’re just killing time at the local coffee shop, it’s a great way to “sketch up” some new designs of your own. Posted on July 31, 2013 July 31, 2013 by Randy MaxeyPosted in Design, Design Software, SketchUpTagged CAD, computers, Design, SketchUp, Tablet, Windows 8.